The Malayan Emergency (1948–60) arose out of an attempt by the Malayan Communist Party to overthrow the British colonial administration of Malaya. Over the 12 years of conflict, New Zealand soldiers, sailors and airmen made a significant contribution to the Commonwealth effort to defeat the communist insurgency. Fifteen New Zealand servicemen had lost their lives in the region by the end of 1960 - three as a result of enemy action. For the New Zealand Army, with its experience of jungle warfare limited to a few small actions during the Second World War, the operations in Malaya were a new departure. They were important in the transition of the New Zealand military from a non-regular to a regular organisational structure. They also offered opportunities to develop professional skills, and laid the basis for effective service in the Vietnam War. The Emergency was declared on 18 June 1948 in response to the murder of three British planters in northern Malaya. It had its roots in post-war economic and political dislocation in Malaya, in particular the disaffection of the Chinese community. The guerrilla campaign mounted by the military arm of the Malayan Communist Party, which in 1949 became the Malayan Races Liberation Army (MRLA), soon confronted the British authorities with a serious security problem. This was partly because of the MRLA’s military effectiveness. Its origins lay in the Malayan Peoples’ Anti-Japanese Army, which had been formed during the Second World War. Approximately 4000 New Zealand servicemen served in Malaya/Malaysia between 1948 and 1966, of whom 15 lost their lives - three as a result of enemy action. Although the Anti-Japanese Army’s resistance activities were relatively limited, and it was seemingly disbanded following the war, its structure and much of its weaponry remained available for reactivation. At its peak in 1951 the MRLA numbered about 8000 men. The support the guerrillas received from a segment of the Chinese community, and the acquiescence of much of the rest, was an important element in sustaining their campaign. Many Chinese were unhappy about their status in the colony – the British had changed their minds about eventually offering them citizenship. The administration had also failed to ensure law and order. The British response to the guerrilla challenge was at first marked by uncertainty and ineptitude. Not until 1950 was a more coordinated programme developed, following the appointment of a retired British army officer, Lieutenant-General Sir Harold Briggs, as Director of Operations. Briggs focused on separating the guerrillas from their support base, both by improving the position of the Chinese community in general and by concentrating civilians living near guerrilla areas in ‘New Villages’. Briggs proposed a systematic approach, moving from south to north. This programme was vigorously implemented by General Sir Gerald Templer, who in early 1952 was appointed High Commissioner with full powers over the military, police, and civil authorities. (His predecessor, Sir Henry Gurney, had been ambushed and killed by guerrillas in October 1951.) By 1954, when Templer departed, these measures had transformed the situation. The CTs (‘communist terrorists’), as the guerrillas were now termed, had been forced back into the jungle, where they struggled to sustain themselves. Subsequent operations against them were essentially a mopping-up exercise. New Zealand first became involved in Emergency operations in 1949, when a flight of 41 Squadron Dakotas were deployed to Singapore as communist victories in mainland China appeared to threaten Hong Kong. Attached to the British Far East Air Force, these aircraft flew regularly to Hong Kong. One Dakota was stationed in Kuala Lumpur to drop supplies to forces engaging the MRLA. By the time the flight was withdrawn in December 1951, it had made 211 sorties and dropped 284 kg of supplies. From 1949, several New Zealand Army officers served in Malaya while on secondment with British units. In January 1951 10 officers and 14 NCOs went there with 1st Battalion, Fiji Infantry Regiment. 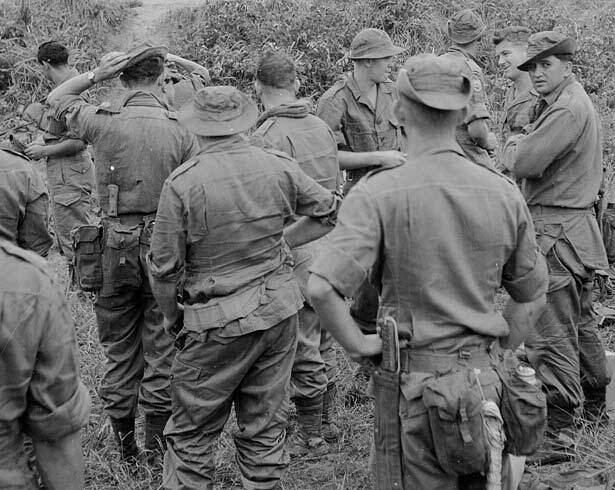 Under the command of Lieutenant-Colonel R.A. Tinker initially, this unit gained a high reputation for effectiveness in operations against the guerrillas. By the time it was withdrawn in 1956 about 40 New Zealanders had served with it, and two had been accidentally killed. In 1954 an RNZN frigate, HMNZS Pukaki, bombarded a suspected guerrilla camp while operating with the Royal Navy’s Far East Fleet. This was the first of a number of bombardments by RNZN ships over the next five years. New Zealand became more directly involved in Emergency operations in 1955 after deciding to contribute forces to the British Commonwealth Far East Strategic Reserve. The Reserve’s primary roles were to deter communist aggression in South-east Asia, and to respond swiftly if deterrence failed. As a secondary role, the forces committed to the Reserve were to participate in actions against the guerrillas in Malaya. The Army’s initial contribution to the Reserve, a Special Air Service Squadron commanded by Major Frank Rennie which formed part of 22nd SAS Regiment, was particularly suited for operations against the guerrillas in their jungle sanctuaries. From April 1956 the squadron deployed in the Fort Brooke area on the border of the states of Perak and Kelantan. In a series of operations the it eliminated the local MRLA organisation, at the cost of one fatal casualty. During 1957 the squadron operated in Negri Sembilan in an area dubbed Mountainous by the guerrillas, between the towns of Seremban, Kuala Pilah and Tampin. Again it destroyed the local MRLA group. In 1965/6, during Confrontation with Indonesia, SAS squadrons mounted cross-border operations in Borneo. Meanwhile, RNZAF units in the Strategic Reserve were also operating against the guerrillas. On 1 May 1955 Vampires of 14 Squadron carried out the RNZAF’s first operational strike mission since the Second World War – and the first using jet aircraft. Over the next three years the squadron, now equipped with Venoms, mounted 115 strike missions in two categories - ‘Firedogs’ (pre-planned bombing, strafing, and rocket attacks on suspected guerrilla targets) and ‘Smash Hits’ (strikes against targets of opportunity in response to a guerrilla raid or ‘hot’ information). The Canberras of 75 Squadron, which replaced 14 Squadron in the Reserve in July 1958, were also used on bombing missions. While the effectiveness of air strikes against jungle targets was inevitably limited, they provided much valuable experience for the pilots. In July 1955 41 Squadron, half of which was deployed in the Strategic Reserve, resumed supply-dropping operations in support of anti-guerrilla forces using the highly effective Bristol Freighter. From March 1958 1st Battalion, New Zealand Regiment, which had replaced the SAS squadron in the Strategic Reserve, took part in operations to clear Perak of insurgents. Operating from Ipoh and later Grik, it mounted a series of deep jungle patrols. Its achievements in eliminating guerrillas were second to none among 28th British Commonwealth Infantry Brigade’s battalions. By the time that it was replaced by 2nd Battalion NZR in late 1959, most of the guerrillas had retreated across the border into southern Thailand. The greatly improved security situation was reflected in the official termination of the Emergency on 31 July 1960. For the next four years New Zealand infantrymen periodically deployed in the Border Security Area as part of counter-insurgency measures. During Confrontation they helped hunt Indonesian infiltrators in Johore in 1964, and saw action on the Borneo frontier in 1965. The insurgents did not finally give up until the 1980s. Fifteen New Zealand servicemen lost their lives in Malaya between 1948 and 1960, three as a result of enemy action. Among the casualties was the crew of a Bristol Freighter which flew into a mountain in 1956. The New Zealand Army’s experience of jungle warfare had been limited to the few small actions by 2NZEF’s 3rd Division during the Pacific War. With its post-war preparations focused on the Middle East, the operations in Malaya marked a new departure. They were also an important stage in the transition of the New Zealand military forces from a non-regular to a regular framework of organisation. They provided opportunities to develop professional skills in a difficult but not too threatening operational environment, and laid the basis for effective service in the 1960s’ Confrontation with Indonesia and the Vietnam War. This web feature was originally adapted from Christopher Pugsley's entry in The Oxford Companion to New Zealand Military History (2000) and produced by the NZHistory team. We have 1 event in history, 4 comments related to Malayan Emergency. was of his contribution he made. ( He still has his original hammock ). I know he has a world of information of what he saw and done over there, but its something us kids never really asked about. I took my father to the Australian War Museum in Canberra 2013 when he came to visit from NZ, I knew how moving the whole experience was for him, we done a 3 hour tour, the Malaysia Emergency display was not on the tour, but our guide kindly took us after the tour to locate it, which was tucked away within the building, it wasnt a huge display, but definitely bougjt back a memory or two for Dad. Dads at an age now ( 76 ) , where I feel id like to ask a few more questions, he was deployed towards the end of the emergency '58 I think, was lucky to come back alive after been shot in the neck, he still has his scar, he got treated and stiched up in the jungle and off he went again. My father is again visiting Australia this year to see his grandchildren and to march here in Sydney on Anzac Day, id also like to take the opportunity to find out more about his time over there so I can hand down the knowledge to my children. All my Best wishes to the NZ SAS --- such Great Guys!! In 1955, the Federation of Malaya Government recruited 12 New Zealanders to serve as Police Lieutenants in the Malayan Police. Some of these men were recruited from Army camps and returned to service after their stint. Their employment was solely anti-terrorist. One man was killed in action and another was wounded on two separate occasions in operations against terrorists. There is no official record of their service in this country.